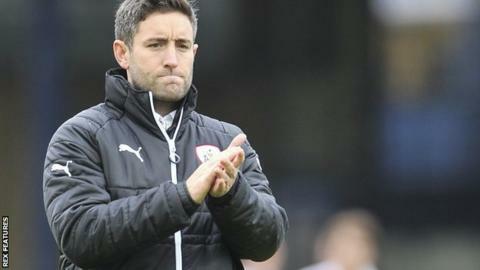 Barnsley boss Lee Johnson says he does not fear for his position after his side suffered a fourth straight defeat. The Reds are 19th in League One, one point above the relegation zone, following Tuesday's defeat by Walsall - their third home loss of the season. "I love this place. I hope I am going to be here for a long time because I want to deliver what everyone wants," Johnson told BBC Radio Sheffield. "I don't have any fears because of the way football is." "I've made mistakes this year and possibly cost us a few points through some tactical decisions but I think I have won us games through some other ones," he added. "I'm as frustrated as anyone but I still massively believe in the group." The Tykes host struggling Fleetwood on Saturday and Johnson, who took over in February after Danny Wilson's exit, believes his side need to cut out defensive lapses to turn their form around. "We've got some really talented players but I think we need to give them real discipline in a structure to make sure everyone gets given really simple roles defensively," he said. "Almost like having robots in defence and then creativity in attack."